If you have been reading our blog than you most definitely are aware of the dangers of mold and the process involved in riding your home of the unwanted growth. For more details about how mold is formed, or how Branch Services can help you can read our March post here: Mold Remediation. Even after Branch Services has thoroughly and expertly removed the mold in your home, there is a chance of mold returning attached to an inconspicuous source. While houseplants are renowned for their decorative appeal, they can also help fight indoor pollutants like formaldehyde or benzene. Sadly, if improperly maintained a houseplant can actually become a source of unwanted pollutants and mold. There are steps you can take to ensure your plants do more than just help your home’s aesthetic. These steps will help to keep both you and your houseplants healthy! The internet is a great resource for learning how frequently a houseplant should be watered. If you are unsure of your houseplant’s ideal schedule you can find articles like this, from Better Homes & Garden. Mold needs 3 things to grow; food, moisture, and oxygen. A houseplant can house all three of these elements in abundance. Moisture is the easiest of the three to manage. Better Homes & Garden suggests adding water until it begins to escape through the containers drainage hole. After the plant has drained the excess water in the tray needs to be dumped. It can take only a day or two before the excess water starts to rot your roots! We also suggest adding gravel to the bottom of the soil to help the plant drain more efficiently. Plants need to be kept in a well ventilated area. Plants emit water vapor which increases relative humidity levels. If the humidity levels around your plant are constantly high, mold can begin to form. Opening a window or turning on a fan can help to circulate the air around your plant. If you are not near a window or fan, you could use a dehumidifier daily to remove the excess moisture. Cinnamon can be used as a natural fungicide. Including a little bit of cinnamon to the soil when first planting seedlings can help fight Damping off. Studies also suggest that it works with older plants to stave off slime mold! There is a chance the plants you have in your house are already exhibiting mold growth. 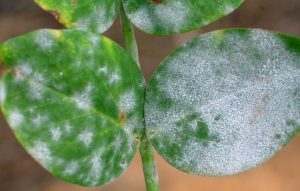 If you see mold developing on plant leaves you should dampen a towel with warm water, ring out the towel of excess water, and gently wipe the mold from the leaves. You should replace the towels frequently for best results. If you see mold growth in the soil you can use a spoon or trowel to remove the contaminated soil. The soil should be placed in a sealable bag and disposed of. After removing all the visible mold you can fill the pot with fresh soil. The only way to ensure your home is free from mold is to bring in an expert here at Branch Services, so that we make check your walls and vents. It should bring you some relief though, to know there are some things you can do to prevent or remove mold in your home!